Note: Work up to a new 1 Repetition Maximum effort on the Shoulder Press. Prescribed weight on the AMRAP is 95lb. for men and 65lb. for women. Add your AMRAP repetitions to your 1 Repetition Max for total score. Dawn – 2 Years of CrossFit Training! When Dawn first walked into CrossFit Amundson in July 2012, there were no Pull-up bars, the ropes had not been hung, and there were no Wall Ball targets. Dawn has a very strong work ethic and is extremely determined once she sets her mind on a goal. Three months after Dawn joined our gym, the ropes were hung, and Dawn set a goal of accomplishing her first rope climb. 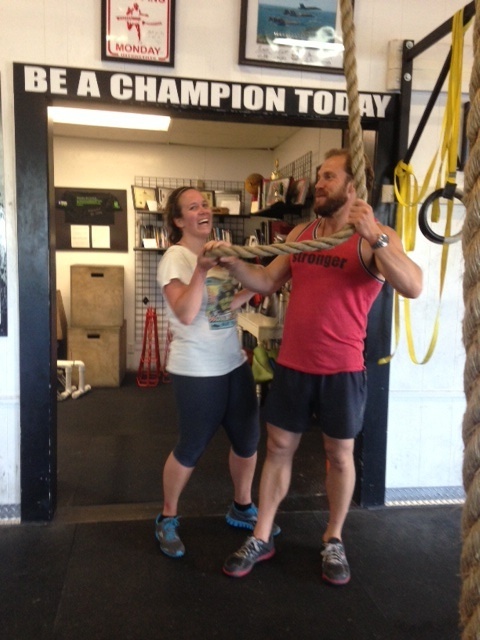 Through relentless practice, focus, and training, Dawn recently accomplished her first rope climb, and over the past two years has captured the hearts of her family and friends with her sense of humor, positive attitude and determined approach to fitness training. Outside the gym, Dawn sets a great example by serving the communities of Watsonville as a teacher. Congratulations Dawn on all your success!